By all accounts, local drivers have become more cautious and mannerly since volunteer cebritas started directing traffic. 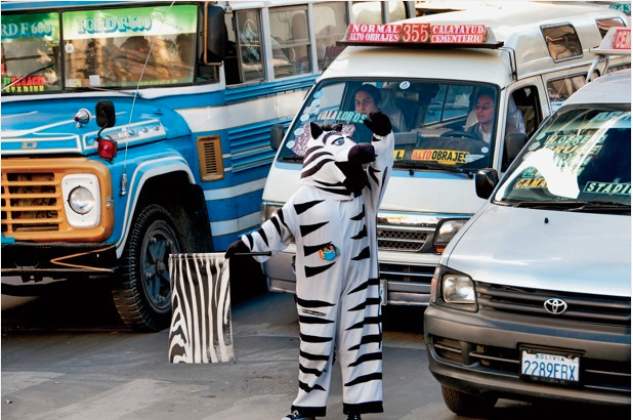 Zebras are running rampant through the streets of La Paz, Bolivia, where they can be seen hanging out in groups, interacting with drivers, and even directing traffic. The cebritas, as they are known, aren’t of the equid variety—rather, they’re local volunteers dressed in full-body zebra costumes. La Paz’s cebritas program is a spiritual successor to a 1990s‑era Colombian initiative launched by Bogotá’s then-mayor, Antanas Mockus, who dispatched mimes to tease and shame the city’s drivers for breaking traffic rules. Mockus, a philosopher and mathematician, believed that Colombians were more afraid of ridicule than of punishment. He appears to have been onto something: The mimes contributed to a 50 percent decrease in traffic fatalities in Bogotá during his tenure. After a meeting with Mockus, Pablo Groux, who worked for La Paz’s government, was inspired to make his city’s “zebra crossings” (striped crosswalks) come alive. La Paz’s cebritas employ similar tactics to Bogotá’s mimes—they dance, gesture comically at drivers, and help pedestrians safely cross the street. When the program launched in 2001, it included just 24 zebras; today, La Paz has 265, and the cities of El Alto, Tarija, and Sucre have dozens more. In addition to their traffic duties, the cebritas visit schools and hospitals, and appear in parades and on television. Most are students from disadvantaged or troubled backgrounds; in exchange for working part-time as cebritas, they receive a small stipend. A project called Zebra for a Day lets tourists and locals alike dress up as zebras and get a taste of the experience. By all accounts, local drivers have grown more cautious and mannerly since the cebritas arrived, and the mood on the streets has improved. “They may be dressed up as zebras,” says Kathia Salazar Peredo, one of the program’s early organizers, “but they defend what is human about the city.” In December, the cebritas won the Guangzhou International Award for Urban Innovation, which recognizes cities and regions with innovative approaches to improving public life. The award’s organizers commended La Paz for its response to a “very serious challenge” confronting cities worldwide—the subordination of pedestrians to cars—with “great humor and understanding,” and said they hoped the project might inspire “more civilized streets” around the world. A great initiative to make more enjoyable and safe using our streets … it is true that latin americans are concerned about being exposed … we fear public ridicule and certainly these zebras do the job!